Lisa Hammond MBE is a soda firing potter who works at Maze Hill Pottery, Greenwich, London. She has been making pots for best part of 40 years in which time she has taught extensively, taken on a dozen apprentices and pioneered soda glaze and shino firings. Lisa Hammond's work is represented in galleries and museums both in the UK and internationally, including Goldmark Gallery. Her work embraces an extensive range of thrown functional ware for the preparation, cooking and serving of food. It is immensely important to her that this work is used in daily life. Alongside functional ware Lisa has always made a range of work that is more individual and playful. The development of these pieces is a result of time spent in Japan, making, firing and exhibiting. Lisa's forms are strong, fluid and unfussy, and are intended to retain a suggestion of the soft plasticity of the clay. 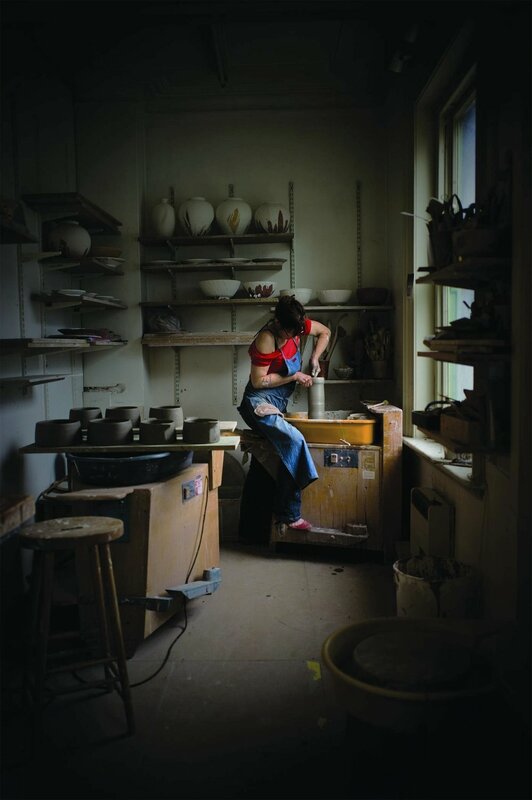 Lisa Hammond has for the past decade championed the revival of studio pottery in the UK. The Adopt a Potter Charitable Trust raised money to fund apprentices to work with master potters and has now completed the more ambitious task of setting up ‘Clay College’ in Stoke-on-Trent. Our aim is to start the first course in September 2017—if you’d like to find out more information, please visit this link.